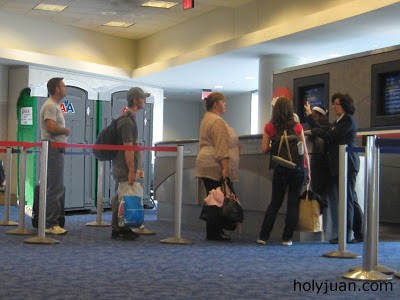 CHICAGO (FD) - American Airlines announced a cost savings measure today that has passengers up in arms and they are literally not taking it sitting down. Airlines have been cutting fuel costs by reducing weight on planes through baggage restrictions and cutting back on provided amenities such as food and blankets. Hawaiian Airlines is currently under investigation for forcing passengers to be weighed and made to change seats to distribute weight. Courts have struck down attempts to charge passengers by the pound so a different route was required. Emulating "The Onion" is not very holy, Juan.